Place all ingredients in bread pan of your bread machine, select Dough setting and start. When dough has risen long enough, machine will beep. directly on oven rack. Bake pitas 4 to 5 minutes until puffed and tops begin to brown. 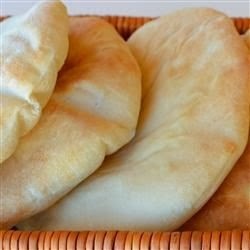 Remove from oven and immediately place pitas in a sealed brown paper bag or cover them with a damp kitchen towel until soft. Once pitas a softened, either cut in half or split top edge for half or whole pitas. They can be stored in a plastic bag in the refrigerator for several days or in the freezer for 1 or 2 months.